The statistic is a reality. I was tongue in cheek, expressing a view that there are other broarder issues to consider. Many parts of Australia flood on a regular basis. Nothing new to see here. What follows are fly in fly out and short term actions. They are genuine and necessary support regardless of the brand of politics involved. P.S. The bench marks and data used to determine 1 in 100 year events is not an exact science. 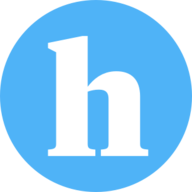 The hypothesis has a confidence level, also a statistic that is limited by the size of the real data set. Our local government 1 in 100 year flood maps have a 1metre upper margin line as a measure of the uncertainty. My mother recalled the date now as the 1946 floods. Our Great Grandmother’s house in Hodel Street in 1946 did not have flood waters through it (not the extension built onto it later) and in these 2019 floods it again did not have water into it. So from that point of view no worse a level than 1946, this is the opinion from our family members who still live there and who had experience of the 1946 floods. My Uncle who built his house at Bluewater and used the 1946 levels to decide it’s placement said it was around the same level as 1946 with his house not affected but he did end up losing some fruit trees and had debris in the yard. What has changed in Townsville is where development has been allowed to occur that is in lower level areas similar to the experience of Brisbane and other places where the demand for land is causing Councils to allow it. 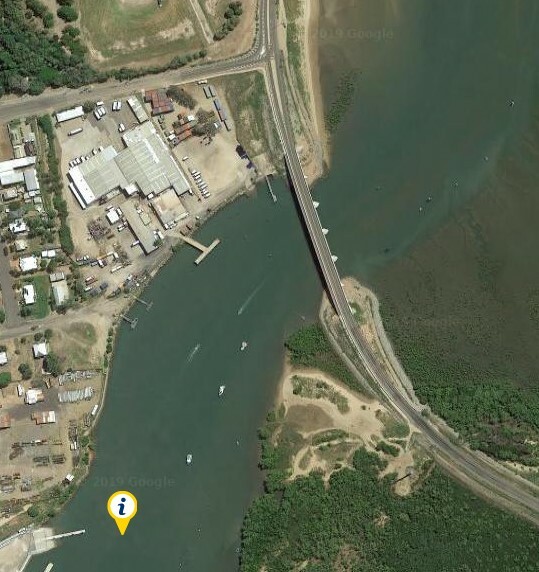 Another example of this problem is that the mouth of the Ross River had some of the mouth constricted by a bridge foundation so that access was easier for residents travelling to some of the south western suburbs. While it isn’t a huge amount, the constriction does not help when flows like flood waters are occurring. Not a good experience at all for those affected and my sympathy is with them, but development for whatever reason that doesn’t look to the past will bear bad fruit sooner or later and people who had no idea of the history will be hurt. So Paul are you saying that when the QLD Premier said it’s a “1 in 500 YEAR flood” it is the same as a “1 in 500 CHANCE of a flood” (this size occurring in any given year)? I agree, Mark. Respect is exactly what is needed. What I am very concerned about for people in FNQ, is will they be able to insure their properties and businesses now? Or will the whole area be declared uninsurable? Eastern Australia is under water in the far North & on fire in the far South. 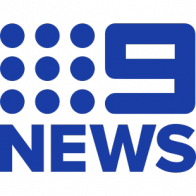 Typical of Australia for sure, but it is the EXTREMES of these natural disasters that is frightening, especially the rate of these changes.People who are in denial constantly quote averages, which misses the point entirely. And then we have over a million native fish dead and dying in their “natural” habitat. The inevitable drought hasn’t helped the situation, but the appalling mismanagement of the Murray Darling Basin is simply heart-breaking. Not just for the fish, the people and the Country, but for the whole of Australia. We can’t leave decision-making in the hands of incompetents and we must hold the perpetrators to account. Paying a fine is totally inadequate - jail time is appropriate for corporate fraud and the same goes for errant Bankers. An the other factor is populations increase in higher risk areas making the impacts of any natural disaster far greater than that which has occurred in the past. Many coastal areas in the world are almost inhabited in an urban or higher density fabric continuously, whereby in the past a there were small villages which wee set in locations which were more resilient to these natural disasters. That is correct, they statistically rate the chance that it would be once in any 500 year period but as in any statistic of similar quotation ie your chance of winning lotto in your lifetime it doesn’t mean it can’t happen three or 4 times in a row but it does mean the chance of that is extremely rare. The trouble is that climate is changing and what were extremely rare severe events are more likely to occur than previously calculated. These include things that are floods, droughts, cyclones (and their intensity), storms, & fires (more vegetation and/or drier vegetation). It’s hard to know if coastal development on its own is responsible for worse outcomes of natural disasters or is it climate change? Also, where I’ve lived for over 20 years (Ballina district) we regularly have salt water inundating roads & streets, even during “drought”. Is it just that the moon is closer & causing bigger tides? Or planets just happen to be lined up? Or have we got the perfect storm - intense residential development on the flood plain with canals & “quays”, complicated by a vast by-pass motorway system that has caused some flooding to go in the opposite direction? One thing is for sure - the local Council is in total denial & continues to pass future developments without any regard. The poor farmers just cop the fallout, with stagnant flood water rotting fodder & breeding mosquitoes. “Ballina” means “place of many oysters” but the Richmond River is so polluted it won’t support edible oysters any more. A call from the Qld Deputy Premier requesting that the banks and insurance companies be good corporate citizens. 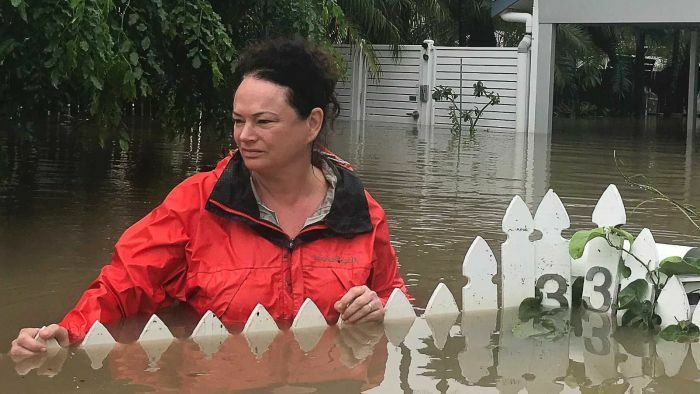 As the Deputy Premier warns banks to be good corporate citizens in showing compassion to flood-affected Queenslanders, insurers insist they are standing ready to assist, even for customers who have not purchased flood cover. 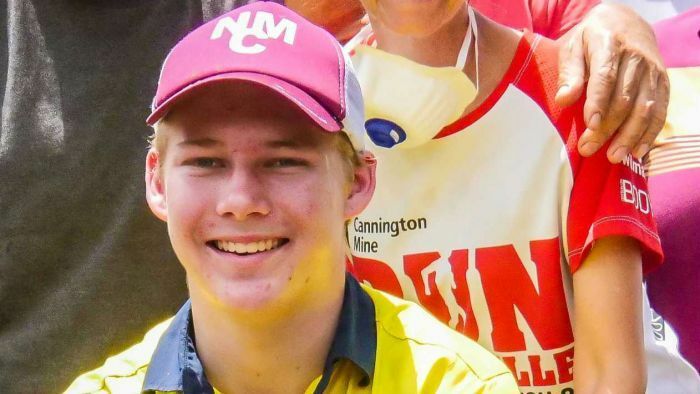 Trayeden Fulmer goes to high school and works part-time like any other teenager, but this young Queenslander is proving his worth in flood-hit Townsville. Some good samaritans to the rescue. 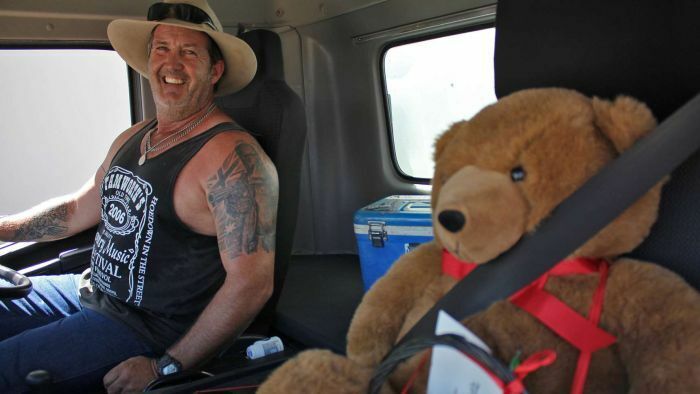 A community campaign started by a Brisbane business owner delivers a truckload of donations to flood-impacted Townsville. 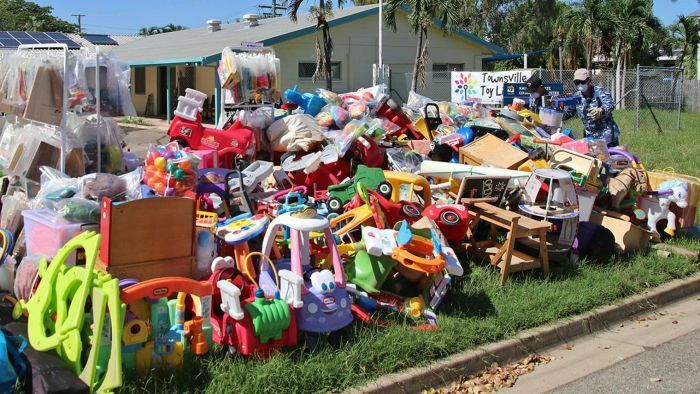 The Townsville Toy Library is throwing out all their stocks of toys. 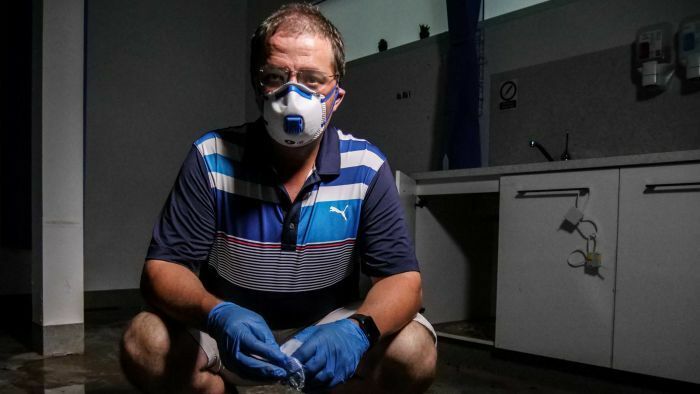 A mountain are being thrown out after contamination by sewage during Townsville's recent floods. I would have expected that the all plastic toys could have been pressure washed and sprayed with or dipped in disinfectant so as to kill any remaining bacteria. After all, the buildings that were flooded will be cleaned thoroughly and not disposed of. all plastic toys could have been pressure washed and sprayed with or dipped in disinfectant so as to kill any remaining bacteria. Yes, could easily be done. It seems a huge waste, especially the plastic items. I wonder if the insurer made the decision, or the toy library as the easier option? 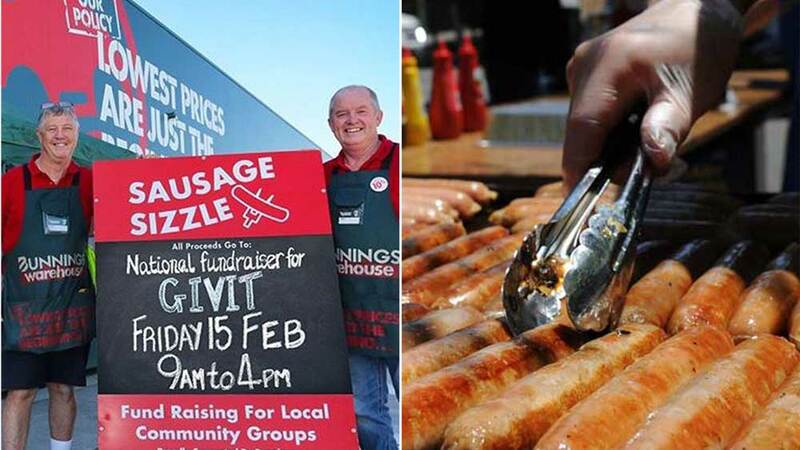 Bunnings are having a charity sausage sizzle tomorrow to support the Qld flood victims and the Tassie bushfire victims. The history of past flooding is only useful to a certain extent, especially where urban development has encroached on a floodplain. Ballina’s Pacific Motorway bypass has caused floodwater to change direction on parts of the floodplain. Residents & farmers are now enduring rotting grass on farmland that used to drain & mosquitoes are breeding in greater numbers, too. Despite this, the local council has continued to approve new housing & infrastructure on the floodplain, even rejecting development on high ground in favour of adjacent land on the floodplain. Should the council be sued for type this incompetency, if future residents cannot insure their properties? The inundation report used to approve one of these developments stated that if sea levels rose .9 of a metre, there would be a 1% to minus 1% chance of this causing a flood to be worse. Such a stupid statement might cover their backsides regarding litigation, but of course the decision-makers, their mates & the profits will be long gone by then. Why is there no government body in place to oversee such development decisions on floodplains? Someone actually accountable? There are professional hydrologists who can perform studies on flood flows. Also to assess the effects of changes to land form and vegetation. They can also determine the sensitivity of any area to changes in rainfall patterns etc. It is also common for two professional consultancies to provide different answers to the same questions. It also depends on what is proposed for the problem or for assessment. It’s a moving target. Can you really sue City Hall? Can you sue the developer once City Hall has issued an approval? If it was that simple there would be a long queue of councils, developers, designers and builders already writing out checks to remedy many things. All without one legal challenge required! it would seem that once City Hall has ticked all the boxes everyone else has a get out of jail free card? Add business arrangements including trusts and shell companies that shield assets or profits from liability. It’s a long hard road to any fair recourse. 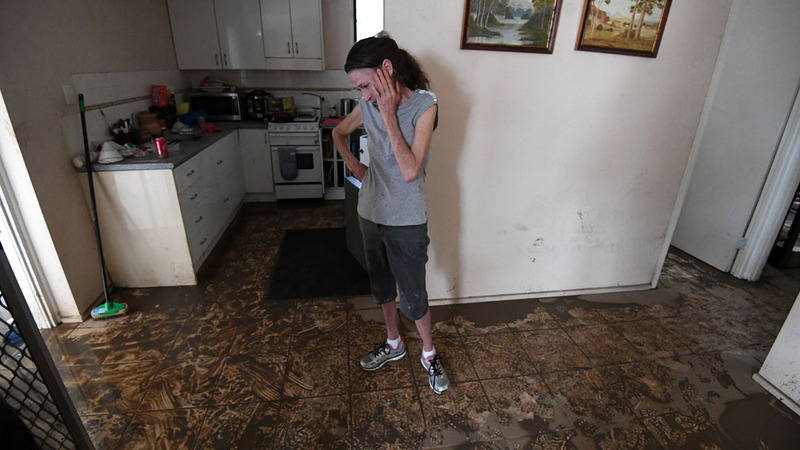 Townsville police have charged a grub with stealing $50,000 to $90,000 worth of property from homes during the floods. 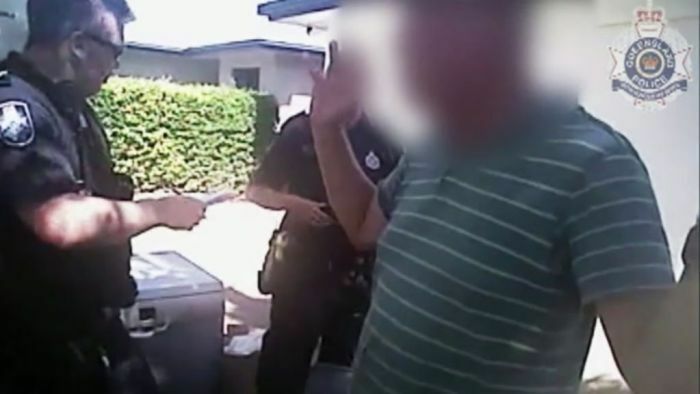 Police charge a man in Townsville over the theft of furniture and white goods from houses in the flood-affected suburb of Idalia. Well done to the police. Hopefully this grub will be made an example of. They WERE professional hydrologists who cut & pasted “…if sea levels rose .9 of a metre, there would be a 1% to minus 1% chance of this causing a flood to be worse.”! We make a big deal about peer-reviewed “science” but what is it really worth when it says “yep” “nup” “-1+1” ? It’s saying nothing, so it’s worth nothing & shouldn’t be allowed to be used in a professional hydrology report, to allow development to proceed. It would be truthful if the report said “We don’t know” or even more truthful to say “We suspect it might be disastrous, or not”. The problem is that once it’s done, it renders all the past data to be null & void. It’s like the question “What’s killing so many bees?” Agriculture? Chemicals in agriculture? De-forestation? Humans? Nothing can be proved, even when the answers are obvious. As fully expected, the ripoff merchants have started preying on the unfortunate victims of the Townsville floods. But not to worry. The QBCC is springing into action. Perhaps they will sentence all offenders to work on the repairs of the nickel refinery which Palmer is said to be still planning to reopen. As fully expected, the insurance companies continue to drag their feet whilst their flood affected clients suffer due to their disregard and greed. Townsville companies say insurance delays mean they can't get back to business after February's record flood.